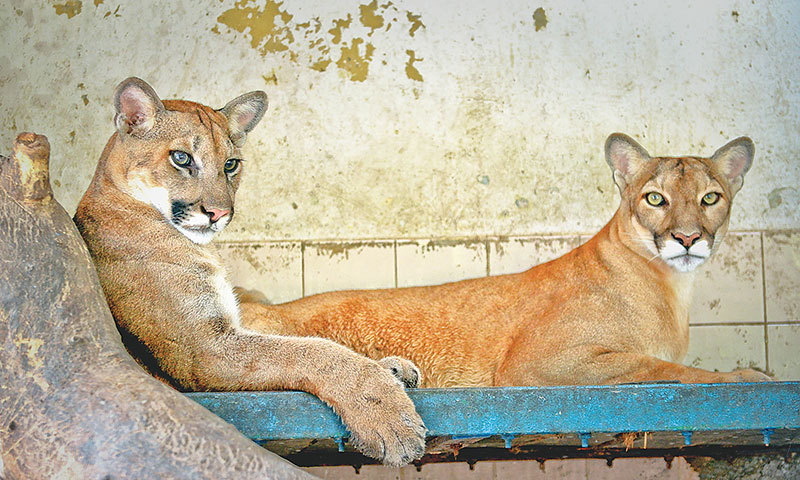 A puma is still living in the small enclosure where it was born about ten months ago in the Karachi Zoo. The young male cat, Jewry, shares the cage having a concrete floor with its mother in the current hot weather though animal experts say a big cat mother should not be kept with its cub for more than three months. He doesn’t look like a baby any more as he is now as big as his mother, though a bit slim. It has also lost the dark colour and spots that it once had at the time of birth and now has attained the same lighter fur as of its mother. The grown-up cat deserve to be shifted to a spacious enclosure where he could jump around, feel the earth under its feet and rest under a shady tree. Dr Masoodul Haq Chaudhry, a senior vet who has a vast experience in taking care of big cats as (former) Bahawalpur wildlife conservator and also as a consultant providing services to different zoos, said that normally a big cat mother was kept with its cub for two to three months. “The baby should be gradually brought on to a separate diet as mother’s milk starts drying up in the third month. The cub, as a matter of habit, continues to suckle but remains hungry. So, it is better to shift the baby at that time to an enclosure according to its needs. Later, the mother can be re-joined with its mate that was separated on birth,” he added. In hot weather like these days, cages meant for big cats were required to have a proper ventilation and cooling system and the animal should be provided with ice blocks. Agreeing with the argument, director of zoo Fahim Khan said that the administration was aware of the animal needs and planned to shift it as soon as a new enclosure was ready. “Right now, we are making him getting used to the idea of living alone by releasing the mother into her mate’s adjacent enclosure for a few hours,” he said, adding that the male puma got mature at the age of three. Apparently, what has been preventing the zoo administration from shifting the animal to a separate cage is lack of expertise as there have been many instances in the past when an animal sedated for shifting with the help of a tranquiliser could not regain consciousness. “We are extra careful since it’s after a long time that a cub has been raised at the zoo,” said a zoo keeper. The facility has a dismal record in handling newborns and often faced media criticism on account of frequent mortalities. The last time the zoo witnessed births in the big cats was three years ago. Three of the four cubs born to a pair of lions were found dead while the fourth one was reported ‘missing’.An inquiry into the case led to the suspension of some officials, who were later reinstated. Puma (also called mountain lion or catamount) is the largest wildcat in North America. Inhabiting various ecosystems from mountains to deserts to sea-level, the cougar’s range includes western North America, a small region in Florida, and most of South America. They make their home anywhere they find food and shelter. Although Puma population has significantly decreased on account of hunting and habitat loss, several thousands survive in the wild and that’s why they are mentioned as ‘least concern’ on the International Union for Conservation of Nature’s Red List.